I walked up St-Mathieu from Maisonneuve, then turned right on Lincoln, right again back onto Maisonneuve, over to St-Marc...where is this place? It was 11:30am and I was looking for noodles and the sign-less restaurant La Maison du Nord. Actually, there is a sign, and it does say "Restaurant", but the words "La Maison du Nord" are certainly not to be seen in either of Canada's official languages. I shamefully walked into Le Roi du Wonton and asked the lady where I could find the actual restaurant I was looking for. It felt like maybe I should order some wontons for the road (1 block, just around the corner) for so rudely leaving the place with the intent of finding lunch elsewhere. Finally I got back to St-Mathieu, having gone full cirlce, and found La Maison du Nord on the east side of the street, just south of Lincoln ((2130 St-Mathieu)...basically where I had thought it should have been in the first place. Look for the number and the sign saying "coiffure" and you'll have no problem finding the place. The whole reason for wanting to come here was to try the "magic" noodles. There is one chef who is capable of taking a long strand of dough and stretching it, pulling it, and miraculously shaping it into a giant soup bowl's worth of glutinous noodles. I sat myself in front of the open window to the kitchen and waited to be amazed. I expected to see noodles flying through the air, being spun, twirled and dangled. In fact, the whole stretching process seemed kind of boring. The man had obviously stretched a whole lot of noodles in his life and he made it look no more complicated than shuffling a deck of cards. Actually, the first time he did it I didn't even notice. He kept his subtle hands under the opening of the kitchen window. I felt cheated because I figured my noodles had actually been machine-stretched as there had been no show made of the whole magic noodle creation, which didn't make sense because I had been warned that it would be a 20 minute wait for the noodles, since the chef had just arrived. This in itself made me skeptical because noodles take a whole lot longer than 20 minutes to make from start to finish usually. You need to combine the dough, knead it, let it rest for awhile, sometimes knead it again, sometimes let it rest again. All in all, it can be a long process. So I'm going to hope that much of this process was pre-done, and the dough had been prepped in advance of the "magic" noodle chef's arrival. You can have these noodles in a whole lot of different kinds of meal soups. I had the noodles in a lamb broth. Most of the options are beef, but you can also get tomato and egg. Vegetarians are a bit out of luck , but maybe you could just get the noodles by themselves?? 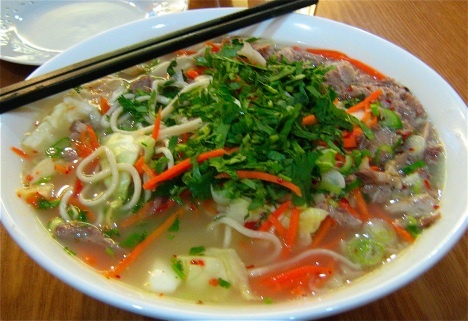 A giant bowl of steaming noodles with shaved, tiny pieces of delicious lamb came to the table. It was topped with a heaping pile of tasteless green onions, along with some also bland carrots, but the highlight of the bowl was the cabbage, which was perfectly al dente and sweet. At least the soup, unlike the noodle throwing, didn't let me down. The broth was surprisingly un-salty, which is definitely atypical of noodle soups in Montreal. Maybe, just maybe, they didn't add a ton of MSG to the broth. Maybe it was actually mostly flavoured by the lamb? I was overjoyed to find that the broth was just a little spicy. It wasn't too greasy, either, which is both a good and a bad thing. It means it was either skimmed of fat, which is unlikely, or a whole chunk of lamb was not used (as would be traditional) to make the broth, but it didn't feel like I was wading through fat to find broth. After being let down by my expectation of the "magic" noodle show, at least the noodles themselves were pretty good. They were filling and comforting and just what a bowl of noodle soup should be, even if for some reason they didn't have any distinguishable noodle taste, like when you make fresh pasta with a really good quality flour. With a bit of black vinegar, though, they were so satisfying, and a great addition to the rest of the soup fillings. I had to try the dumplings to compare them to Qing Hua down the road. The dumpling wrapper here was thinner, and the fillings weren't as juicy. In my shrimp, chive and and egg dumplings I had a hard time finding any shrimp. I would have liked them better if the sauces that accompanied them were better. The hot sauce didn't taste like anything. I'm pretty sure it was just chili flakes and oil, so it really didn't help the dumplings out at all. The black vinegar was good, but I'd had enough of that with the soup. The soy sauce provided was just packets of Wings. Does the trick, I guess. The exciting part of the meal for me ended up being the dishes that you don't find in every other Chinese restaurant. 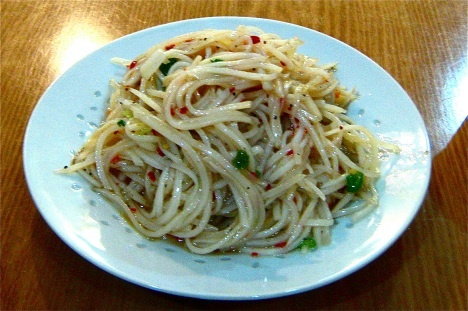 The Northern Chinese (Shaanxi) dishes, like a side dish of spicy shredded raw potatoes in a salty, spicy, and sour sauce, were delicious! They kind of tasted like noodles, and certainly looked the part. It would be an amazing lunch if Montreal's raw foodists got together at the very un-vegan La Maison du Nord to talk about the values of noodles made of potatoes and turnips. Finally a sweet baked flatbread filled with a periodically sweet sesame paste. "Periodically", because whoever made the paste didn't stir in the sugar very well, so some bites were sweet and some were savoury, which was actually pretty fun. One bite would taste like natural peanut butter, and the next would taste like Kraft's sweet and salty version. The bread was beautiful. 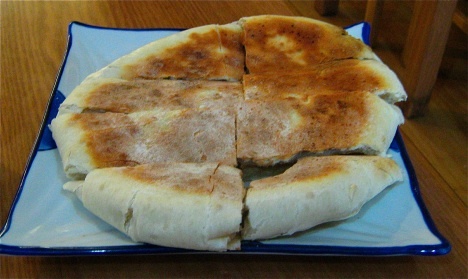 Kind of like a Northern Chinese version of naan. It had the most flavour of all the doughy foods I tried. The wheat flour definitely won out over the glutinous flour used for the noodles. The price? Ridiculously affordable. Even though you can get a dozen dumplings here for $8, which beats Qing Hua's pricing, I'd still say it's worth it to "splurge" down the road. 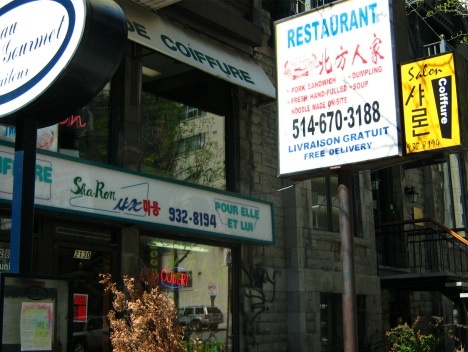 It's all relative, since it's not like Qing Hua is particularly expensive in the grand scheme of Montreal restaurants. The Maison du Nord sweet bread was $2.99, and makes a great snack for two at any time of the day. You can get lamb soup for $3.99, but with the noodles it gets bumped to $7.99, which is basically two meals of soup and so, so many noodles. You could also come here and order main dishes (mostly pork-based, or fried fish and vegetables) for slightly more money (around $8-$10 a dish), and leave happily stuffed or with leftovers. Whatever you get, you won't spend a fortune and you'll be very full. Oh, and tax is included! Nice review. Haven't tried the hand pulled noodles myself but my friend said they were good and reminded him of ones he had in the Philippines. I remember in China actually going to a workshop to make hand-pulled noodles. I had a piece of dough that I would slam on the table kneed and then lift up and twirl it in a braid and then slam it again. Gradually I'd add more flour and the dough would begin to separate into strands or at least that was what was suppose to happen. I just ended up with dough stuck to my hands. Wow, that's an amazing video. That's what I dreamed about. I think I would have kept ordering more noodles just to see the guy do it again, but now I don't have to because there's a video. Hurray for YouTube. Do you remember why you slam the noodles? The dough makes sense because it would kept the newly formed strands from sticking together, but I don't understand the slamming. No clue why the chef I saw slammed the noodles/dough onto the table. Maybe it's just a variation or different technique. Or maybe the chef was just irritable that day. That looks sooooooooooooooo tasty! We love mnaikg homemade chicken and stars for easy fall/winter lunches. Yum yum yum. This reminds me that I need to make some chicken stock! His group was a precursor of the Daesh and Rishawi's brother, Samir Atrussal-Rishawi, who was also killed in Iraq, was one of Zarqawi's lieutenants. polo ralph lauren Many residents are part of the cast of the musical comedy show ??unsense? ?at the Laguna Hills Community Center from Feb. 7 to 15. The production, which is being launched by On the Edge Theatre Productions, will be performed at 25555 Alicia Parkway in Laguna Hills. As the mother and child were being examined and interviewed at the hospital, Deaquino arrived and was placed under arrest. When he was interviewed at police headquarters, he told investigators that he was having trouble with the baby because she kept crying and bit the side of her face in hopes of getting her to stop, Hohn said. polo ralph lauren outlet Mitchell at Newbury, ppd., Feb. 11, 6 p.m. Generous EV-only range, but design limits room to just four passengers.of performance at an attractive price. polo ralph lauren men The Golden Globes are often considered a better TV show than the Oscars, because the audience is looser, and there?? something of a drunken party atmosphere. But everyone was pretty much on good behavior this year, without even the usual sniping at the hosts, the Hollywood Foreign Press. and shared emcee duties and walked the line that eludes other awards emcees of being irreverent and funny without making people cringe. Then again, the Globes are an easy gig, at least compared with the Oscars, because at the Globes the audience isn?? sitting there terrified. Armando Franca polo ralph lauren outlet I still tell Devin I am better than him, Cromartie said, grinning. Now that I have a touchdown I say I'm closer to Montee's record than he ever will be. Here is a look at the Super Bowl on television, then and now. ralph lauren outlet Aston Martin On Ice returns to the authentic western town of Crested Butte in the heart of the Colorado Rocky Mountains next month (February) for a second season of adrenaline-fuelled thrills and luxurious living. e In addition, the Internet has been flooded with countless right-wing hate sites and Facebook groups. Just one anti-Islamic blog, Politically Incorrect, is reporting about 70,000 visitors a day. polo ralph lauren men Of the 30 years I have lived in Oakland, 17 have been in Rockridge, and as a mother of young children, I walked daily, pushing the stroller down the streets of my village to shop at the small stores that lined the avenue. It forecast that by 2019 more than 212 million people would be out of work, up from the current level of 201 million. The fact that unemployment will continue to rise, even a decade after the global financial crisis of 2008, indicates that it was not a cyclical downturn but signified a fundamental shift in the world economy. ILO managing director-general Guy Ryder said that more than 61 million jobs had been lost since 2008. polo ralph lauren men In fact, at the CES show in Las Vegas, most of the drones that were being demonstrated were of the quadcopter variety: four propellers on a horizontal plane with a streaming video camera suspended between them. You can always find the products you need in our company! Welcome to inquire us about our product and anything we know and we can help in auto spare parts. We are looking forward to work with you for a win-win situation. If possible, please send your requirements with a detailed list including the style/item and quantity you require. We will then send our best prices to you. We welcome customers from all over the world come to discuss business. We supply high quality products, reasonable prices and good services. We hope to sincerely build business relationships with customers from at home and abroad, jointly striving for a resplendent tomorrow. Special emphasis around the packaging of merchandise to avoid any damage during transportation,Detailed interest into the useful feedback and strategies of our esteemed shoppers. We are also the appointed OEM factory for several worlds' famous products brands. Welcome to contact us for further negotiation and cooperation. We are going to do our greatest to satisfy or exceed customers' prerequisites with excellent goods, advanced concept, and economical and timely company. We welcome all clients. With a wide range, top quality, reasonable rates and stylish designs, our products are extensively used with this industries and other industries. Our concept would be to assist presenting the confidence of each prospective buyers while using the offering of our most honest service, as well as right merchandise. They are sturdy modeling and promoting effectively all over the world. Never ever disappearing major functions within a quick time, it's a have to for you of fantastic good quality. Guided by the principle of Prudence, Efficiency, Union and Innovation. the corporation. ake an excellent efforts to expand its international trade, raise its organization. rofit and raise its export scale. We are confident that we are going to have a bright prospect and to be distributed all over the world in the years to come. Our main objectives are to provide our customers worldwide with good quality, competitive price, satisfied delivery and excellent services. Customer satisfaction is our main goal. We welcome you to visit our showroom and office. We are looking forward to establish business relation with you. Till now, the items list has been updated regularly and attracted clients from around the globe. Comprehensive facts is often obtained in our web-site and you'll be served with premium quality consultant service by our after-sale group. They are likely to help you get thorough acknowledge about our goods and make a satisfied negotiation. Company go to to our factory in Brazil is also welcome at any time. Hope to obtain your inquiries for any pleased co-operation. Should you be fascinated in any of our products and services, remember to do not hesitate to make contact with us. We're ready to reply you inside of 24 several hours soon after receipt of one's ask for and also to develop mutual un-limited advantages and organization in around potential. For more information, please contact us as soon as possible! Now we have a excellent team supplying specialist service, prompt reply, timely delivery, excellent quality and best price to our customers. Satisfaction and good credit to every customer is our priority. We have been sincerely looking forward to cooperate with customers all over the world. We believe we can satisfy with you. We also warmly welcome customers to visit our company and purchase our solutions. We have now 48 provincial agencies in the country. We also have stable cooperation with several international trading companies. They place order with us and export solutions to other countries. We expect to cooperate with you to develop a larger market. They're durable modeling and promoting well all over the world. Under no circumstances disappearing key functions in a brief time, it's a should for you personally of fantastic quality. Guided by the principle of Prudence, Efficiency, Union and Innovation. the business make an awesome efforts to expand its international trade, raise its enterprise. rofit and improve its export scale. We are confident that we'll have a vibrant prospect and to be distributed all over the world in the years to come. We value your inquiry, For more details, please contact us, we will reply you ASAP! As a result of our hard perform, we have always been around the forefront of clean technology merchandise innovation. We've been a eco-friendly partner you can rely on. Get hold of us today for additional data! Customer satisfaction is our main goal. We welcome you to establish business relation with us. For further information, please don't hesitate to contact with us. We have been normally seeking forward to forming profitable company relationships with new clientele around the environment. Many years of work experience, we have realized the importance of providing good quality products and the best before-sales and after-sales services. Most problems between suppliers and clients are due to poor communication. Culturally, suppliers can be reluctant to question things they do not understand. We break down those barriers to ensure you get what you want to the level you expect, when you want it. faster delivery time and the product you want is our Criterion . Our products and solutions are sold to the Middle East, Southeast Asia, Africa, Europe, America and other regions, and are favorably appraised by clients. To benefit from our strong OEM/ODM capabilities and considerate services, be sure to contact us today. We will sincerely create and share success with all clients. With superb service and quality, and an enterprise of foreign trade featuring validity and competitiveness, that will be trusted and welcomed by its clients and creates happiness to its employees. All our products are exported to clients in the UK, Germany, France, Spain, the USA, Canada, Iran, Iraq, the Middle East and Africa. Our products are well welcomed by our customers for the high quality, competitive prices and the most favorable styles. We hope to establish business relationship with all customers and bring more beautifu colors for the life. To meet the requirements of specific customers for each bit more perfect service and stable quality merchandise. We warmly welcome customers around the world to visit us, with our multi-faceted cooperation, and jointly develop new markets, create a brilliant future! Our items are exported worldwide. Our customers are always satisfied with our reliable quality, customer-oriented services and competitive prices. Our mission is "to continue to earn your loyalty by dedicating our efforts to the constant improvement of our merchandise and services in order to ensure the satisfaction of our end-users, customers, employees, suppliers and the worldwide communities in which we cooperate". As an experienced group we also accept customized order and make it same as your picture or sample specifying specification and customer design packing. The main goal of our company is to build up a satisfactory memory to all customers, and establish a long term win-win business relationship. Choose us, we always wait for your appearance! we are sincerely hope to establish one good long term business relationship with your esteemed company thought this opportunity, based on equal, mutual beneficial and win win business from now till the future. All styles appear on our website are for customizing. We meet up to personal requirements with all products of your very own styles. Our concept is to help presenting the confidence of each buyers with the offering of our most sincere service, and the right product. We, with open arms, invite all interested potential buyers to visit our web-site or get in touch with us immediately for further information and facts. We warmly welcome your patronage and will serve our clients both at home and abroad with products and solutions of superior quality and excellent service geared to the trend of further development as always. We believe you will benefit from our professionalism soon. We have been wanting forwards to creating long-term company interactions with around the world shoppers. The working experience in the field has helped us forged a strong relations with customers and partners both in domestic and international market. For years, our products have been exported to more than 15 countries in the world and have been widely used by customers. we have all day online sales to make sure the pre-sale and after-sale service in time. With all these supports, we can serve every customer with quality product and timely shipping with highly responsibility. Being a young growing company, we might not the best, but we are trying our best to be your good partner. Welcome you to be a part of us alongside one another to create your company easier. We're normally your finest partner when you want to have your own organization. We can give our clients absolute advantages in product quality and cost control, and we have full range of molds from up to one hundred of factories. As product updating fast, we succeed in developing many high quality products for our clients and get high reputation. Normally to the majority of business users and traders to offer best quality goods and excellent company. Warmly welcome to join us, let's innovation collectively, to flying dream. We invites you and your company to thrive together with us and share a dazzling foreseeable future in world-wide market place. We have been searching ahead to even better cooperation with overseas buyers dependant on mutual benefits. Be sure to really feel totally free to speak to us for additional element! Welcome any inquiry to our company. We will be glad to establish friendly business relationships with you! As a leading manufacture and exporter, we enjoy a good reputation in the international markets, especially in America and Europe, because of our top quality and reasonable prices.